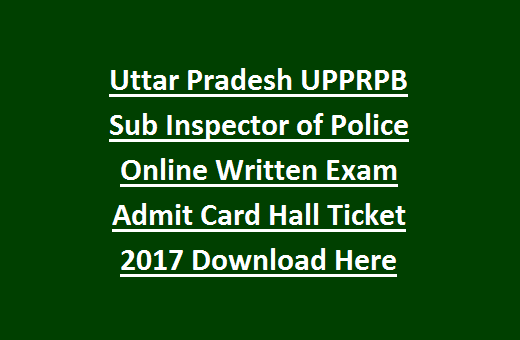 UPPRPB SI Recruitment Admit Card: Uttar Pradesh government had released a notification for issuing the hall tickets of sub inspector posts. This notification was released on July 1st 2017 and it also provides complete information about admit cad downloading procedure. There are three steps involved in recruitment of sub inspector posts they are online written exam, physical standard test, physical endurance test. Every candidate who applied for this posts can download their exam hall ticket from official website and that should be bring to attend the exam. Total vacancies for Uttar Pradesh up sub inspector posts are 3307.After qualifying online written exam with 50% marks in each subject, candidate will be invited for physical standard test followed by physical endurance test. In this online written exam candidate should secure at least 50% in each subject to get qualified. One should bring that downloaded admit card to the exam hall along with one original id proof. The online exam will be conducted between 16-07-2017 to 31-07-2017 and The results will going to be announced within two months from the date of exam. Both male and female candidates are eligible to apply these vacancies and there will be separate link for female & male to download the written exam hall ticket. After getting the uttar Pradesh sub inspector hall ticket first verify your details on hall ticket are correct or not, if any mistakes appear immediately inform to concern board but at least a day before the exam. 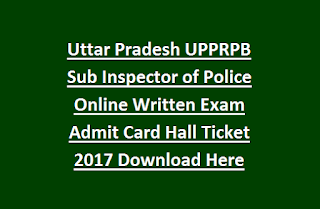 Candidates who apply for Uttar Pradesh 2017 Sub Inspector recruitment vacancies can download their online written exam hall ticket from department official website. It is advisable to hold more than one copy along with one id proof to the examination hall. For downloading admit card candidate must have registration number and password , date of birth appeared in application. Admit card contains exam date,all ticket number and venue. Candidates are supposed to visit the examination venue before attending the exam. As it is an online exam no grace time will be given to candidates for any reason,so one should attend exam within time.